Some very good friends of ours recently marked their 25th wedding anniversary, and they celebrated in a way that makes total sense to me – they went to Disneyland. I’m not ordinarily one to give other people anniversary gifts, but I couldn’t pass this one up. You might remember the Mickey and Minnie Coffee Cup Sleeves I made last year? Well, they were a perfect pair for our friends to enjoy on their trip, so I made that happen. It also seems like it’s about time to share the tutorial with you here! We’ll start with Mickey. Cut one of the pieces marked “top” and one of the “back” from the black fabric. Cut one “bottom” from the red. Cut one piece of Insul-Bright using the “back” piece. 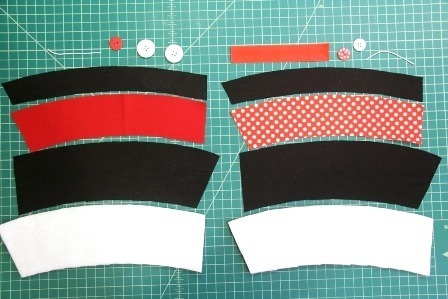 For Minnie, cut one “top” and “back” from the black and one “bottom” from the red dot. You’ll also need a “back” Insul-Bright for this one. Cut the elastic in half so you have 3” for each sleeve. Bring the ends of each piece together and tie or stitch to form a loop. For each sleeve, sew the black top to the red bottom. This one is a little tricky because the curves fight each other a bit, but I’ve found if I’m careful not to stretch it and match the edges as I go it fits together just fine. Stitch the two ends of the ribbon together to create a loop. Layer with the Insul-Bright on the bottom, followed by the front of the sleeve. Center the elastic on the end to your right. The loop should be to the inside and the ends extended past the fabric. Pin the back piece face down over the top. Stitch 1/4” from the edge, leaving 2” open at the bottom to turn. I stitch over the elastic several times to keep it secure. Clip the corners, turn the sleeves right side out and press, turning in the opening. Topstitch around the outside near the edge. To add the bow to the Minnie sleeve, make sure the seam is at the back the ribbon, then wrap a thread around the center and pull it tight to gather. 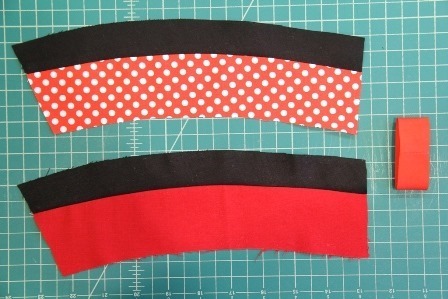 Stitch it onto the Minnie sleeve at the center, where the two fabrics meet. Stitch the red button over the top. For Mickey, sew the two large white buttons about an inch apart at the center. Use a pencil to mark the spot the elastic reaches when the sleeve is closed. Sew the button over the mark. Just in case you’re afraid it’s too hot at the Disney parks for these, they work equally well for cold drinks! This is the set I gave our friends. I changed up Minnie’s bow a little and gave Mickey some bigger buttons, so we wouldn’t get them mixed up. I received several texted photos of the sleeves enjoying their time in Disneyland, so I think they were a hit!